I’ve been trying to get pubsub to work on Openfire and Smack for about a week. Finally I’ve managed to get it working this morning so I’ve decided to document seeing that it quite difficult to get all the info in 1 place. The solutions came from various place but in particular from ignite realtime forum and stackoverflow thread. So many thanks to those folks over there. 1. Openfire server 3.6.4. Setup a few account for testing. Note: you can use any XMPP server but you have to make sure that the pubsub service is running. 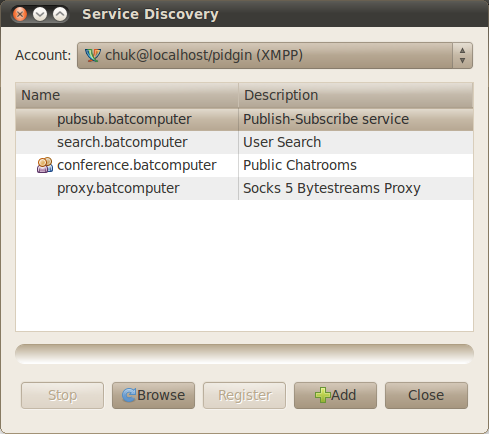 One way to do this is to use Pidgin, install the XMPP Service Discovery plugin and introspect the server. You should see something like this. 2. Smack from SVN. The release version does not have support for pubsub viz. there are nice classes like PubSubManager, etc. You will have to construct the pubsub stanza yourself. If you writing a real app, you would probably not use SimplePlayload but extend from org.jivesoftware.smackx.pubsub.Item.